Throughout product design and development in both sectors, Voice of the Customer market research is of paramount importance as a driver of future market success. The landscape of failed consumer products is filled with companies that skipped this step entirely, bringing products to market in a VOC vacuum. In some cases, consumer products in established categories that have already completed extensive customer activity research can make low-innovation product line extensions that respond to trend insights observed from changes in cultural behaviors. The stakes are significantly higher with medical devices, whereas each product requires extensive input from the myriad of customers and stakeholders - patients, practitioners, third-party payers, and internal constituents. In their July 2000 Journal of Business Research piece, “Does Customer Interaction Enhance New Product Success,” Kjell Grunera and Christian Homburg offer the following guidance to companies trying to bring voice of customer research into the development process in the right way, and, more importantly, perhaps, at the right time: "Most important, we could support our fundamental hypothesis that customer interaction in new product development has a positive impact on new product success. Additionally, our study provides specific insights in which stages customers should be involved and we provide guidance on which customers to select for cooperation. The results encourage firms to interact with customers specifically in early and in late stages of the new product development process. A deficit in current business practice is particularly evident in the early stages (idea generation, product concept development). The study found no benefits in interacting in the two medium stages (project definition, engineering)." 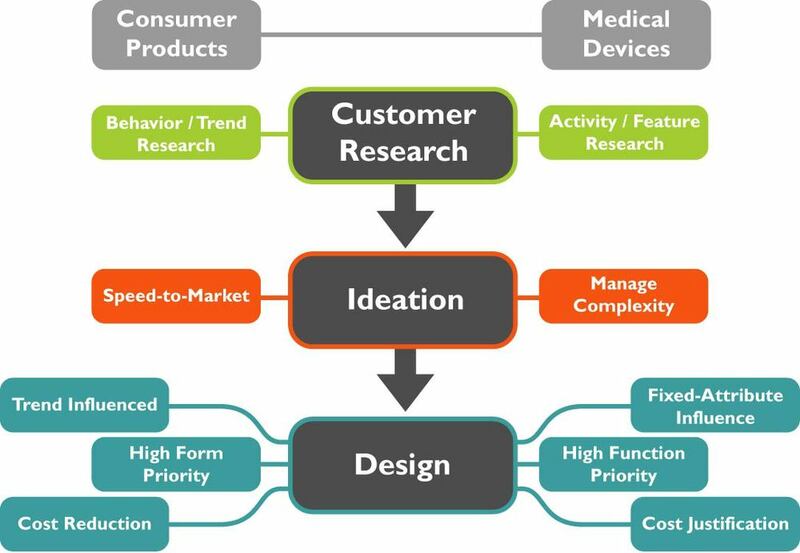 A point of contrast between the consumer product sector and the medical device field is the application of ideation, which involves preparing a strategic understanding of the key opportunities, bringing the stakeholders together, and facilitating a brainstorming session focused on generating solutions to address the key opportunities. The main driver of difference between medical devices and consumer products is the required competencies for delivering innovation and mitigating risk. Typically, companies in the medical device industry have stronger competencies for mitigating the higher risks involved at a financial, product performance, and regulatory level. Therefore, the medical device industry gives far greater attention to thorough, focused ideation sessions that hold the search for innovation in balance with addressing challenges early in the process. In contrast, ideation for most consumer products is utilized to a much smaller scale, in part, because the product’s life-span is usually shorter, necessitating faster development cycles and incremental innovation with reduced risk profiles. With regard to industrial design, innovation managers should pay attention to several different types of attributes when developing products across these respective industries. Consumer products, in contrast to medical devices, hew much closer to fashion influences, as seasonal changes in color, pattern, and textures can drive sales by tracking changes in societal behaviors. Medical devices, rarely considered fashionable, are more heavily influenced by the features and benefits being delivered. Industrial design in medical devices makes significant contributions to ergonomics and the user interface. The FDA has stressed the importance of human factors in managing risk of medical error through poorly designed user interface. In some cases, the sheer engineering prowess required to achieve the functional needs of the medical device overshadows the original aesthetic goals of the product. Good design holds both engineering and aesthetics in proper balance, adding sophisticated details that better appropriate the technical wizardry accomplished by the device’s function. Sophisticated designers therefore seek that balance in a device that not only achieves the desired functionality, but also brings to bear non-product intangible benefits of appealing to practitioner's sense of pride in their work and competitive differentiation among hospitals and clinicians that employ the device. In consumer products, design and engineering objectives are addressed almost in parallel to increase the speed to market, reduce costs, and make sure the right product is hitting shelves at the right time. In summary, the product development arenas for medical devices and consumer products do share some similarities with regard to key innovation management skill sets, especially with regard to market research, and specifically with regard to voice of customer research. In the areas of ideation and industrial design, however, developers see a real shift in tool kit priorities, as the lower margin, higher volume sales world of consumer products tends to diminish the investment in deep-dive ideation sessions. This more cost-intensive area tends to dictate significantly higher levels of compromise in the area of industrial design as well, sacrificing the customer experience to achieve a lower price point.